Very few horror movies would last past the second act if the characters in these films were actually fans of horror movies. Some time after the first occurrence of Scary Old Timey Music Wafting Through the Vents, after Creepy Bugs Fluttering Inside the House and certainly by the time of the "Accidental" Fall That Sidelines a Key Character — well, that's when any red-blooded, movie-going individual would run out the front door and never look back. In addition to at least three or four jump-in-your-seat stingers, we get some of the most creatively chilling nightmare sequences in recent memory. A stylized dream (which is really a transferred memory) set in the 19th century, in which we see a crazed young woman creating bloody terror before leaping off a cliff with her newborn, all of it shown from the madwoman's point of view? That's a lot more innovative than anything we're likely to see in yet another film about a plodding behemoth in a mask chasing after dumb teenagers through the woods. In the prologue to "Mama," we learn of a shooting at a financial firm after an economic crash. A distraught executive named Lucas (Nikolaj Coster-Waldau from "Game of Thrones") arrives home, quickly collects his two young daughters, Victoria and Lilly, and speeds off. They wind up in an abandoned house deep in the forest, where Lucas apparently intends to shoot his daughters before he can kill himself. That's not quite how it works out. Flash forward to five years later. Lucas' brother Jeffrey (also played by Coster-Waldau) has never given up hope. His team of searchers finally stumbles on to the very abandoned house we saw a century ago in the nightmare. Dad's long gone, but the girls are still there — covered in mud, making strange noises, crawling on all fours in rapid fashion like wild animals. How could they have survived on their own? The girls are kept in isolation for a few months as Dr. Dreyfuss (Daniel Kash) records their every move while ostensibly helping with their assimilation. Given that Victoria keeps making cryptic references to an unseen "Mama" and Lilly sleeps under the bed, gnaws on fruit, twigs and the occasional bug, and screams whenever anyone tries to touch her, the girls hardly seem ready for ice cream, pajamas and bedtime stories, but Jeffrey is determined to give them a normal life. So Jeffrey and his rocker-chick lover, Annabel (Jessica Chastain in a black wig and a tattoo sleeve), take the girls to their new rent-free home, provided by the ever-lurking Dr. Dreyfuss, who wants only to keep studying the little ones. For the longest time we don't see much of the ghostly Mama, who apparently has been alternately caring for and terrorizing the girls all these years and has made the trip with them to suburbia. She flashes by the screen, or we see just the top of her head as she zips about the house. Once we do see her, yipes. Thanks to a combination of CGI and a performance by the extremely thin, extremely tall Spanish actor Javier Botet, this is one frightful Mama. The real mother in the story is Annabel, who slowly sheds her tough-talking, who-gives-a-bleep exterior as her nurturing instincts take over. It's worlds away from Chastain's Oscar-nominated turn in "Zero Dark Thirty" and further proof she's one of the finest actors of her generation. Some elements of "Mama," including the dream sequences, are reminiscent of Japanese horror films. There's also some dark and wicked humor, as when Lilly plays and giggles with an offscreen Mama while Annabel goes about household chores, oblivious to the insanity occurring just around the corner. Coster-Waldau is solid in what turns out to be a supporting role, and Megan Charpentier and Isabelle Nelisse are terrific as the little girls. 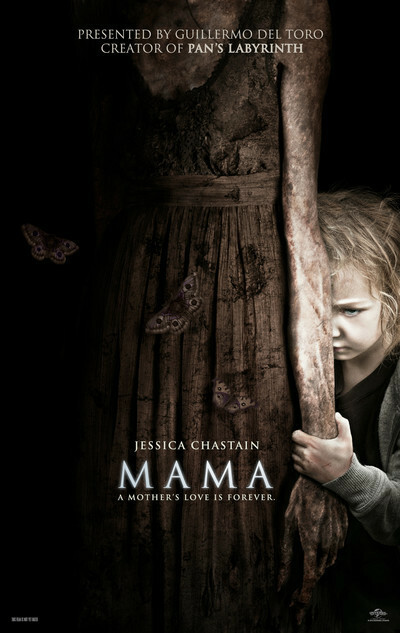 Movies like "Mama" are thrill rides. We go to be scared and then laugh, scared and then laugh, scared and then shocked. Of course, there's almost always a little plot left over for a sequel. It's a ride I'd take again.